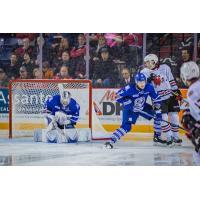 The Niagara IceDogs headed to Mississauga tonight for their second match-up agains the Steelheads in less than two weeks. The last time the 'Dogs were in Mississauga they skated away with the 8-6 win, courtesy of a 5-point afternoon by Akil Thomas. Tonight's game comes the day before the anniversary of Ben Jones setting an IceDogs record for scoring the two fastest goals in a game (20 seconds apart against the Oshawa Generals). Just 1 minute, 33 seconds into the game, Matthew Philip scored on Steelheads' netminder Jacob Ingham to gain the early 1-0 lead. Philip's third of the season was assisted by Akil Thomas, who picks up his 6th point against Mississauga in two games. Just over five minutes into the game, Kyen Sopa doubled our lead with his 3rd of the season. Oliver Castleman and Billy Constantinou were credited with the assists. The Steelheads scored three consecutive goals to take a 3-2 lead. Kirill Maksimov tied the game up at 3 on the powerplay with his 5th of the season. Ben Jones and Akil Thomas picked up the assists on Maksi's goal. With his equalizer, Maksimov and Jones each extended their point-streaks to six games. The Steelheads scored toward the end of the period to take the 4-3 lead into the second. Stephen Dhillon took over the net to start the middle frame. Stevie made an incredible stacked pad save on a penalty kill towards the end of the second period to keep the score at 4-3 for the Fish heading into the 3rd period. Dhillon came up with two huge saves in tight on Ryan McLeod, first on a breakaway and then with a sprawling stick save to prevent the Steelhead from scoring. Maksi came up big for us, scoring a powerplay goal to tie the game up at 4! Kirill's shot slipped past Ingham five-hole. Ivan Lodnia and Akil Thomas picked up the assists. The 'Dogs pressed hard but couldn't get the equalizer in regulation. This game went into the overtime, where Mississauga scored with 1:09 remaining. The 'Dogs picked up a big point despite falling 5-4.